This well-established international series examines major areas of basic and clinical research within neuroscience, as well as emerging and promising subfields. This volume explores interdisciplinary research on Attention and interaction of Attention with other cognitive processes including perception, learning, and memory. The papers cover major research on attention in Cognitive Neuroscience and Cognitive Psychology. 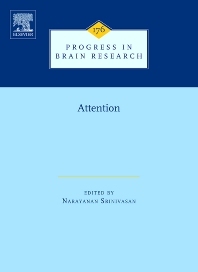 The volume presents recent advances on attention including binding, dynamics of attention, attention and perceptual organization, attention and consciousness, emotion and attention, development of attention, crossmodal attention, computational modeling of attention, control of actions, attention and memory, and meditation. Narayanan Srinivasan, Ph.D., is currently Professor and Head at the Centre of Behavioural and Cognitive Sciences (CBCS), University of Allahabad. Dr. Srinivasan was a visiting scientist at the Riken Brain Science Institute from 2006-2012. He has a Master degree in Electrical Engineering from Indian Institute of Science and PhD in Psychology from University of Georgia. He worked as a postdoctoral fellow at the University of Louisville. He also worked at the Nanyang Technological University in Singapore for two years before joining one of the first centres for Cognitive Science in India. He has been working at CBCS for the past fourteen years. He is interested in understanding mental processes, especially attention, emotions, consciousness and meditation using multiple methodologies. Dr. Srinivasan has edited seven books and three special issues. He has more than hundred and forty publications. Dr. Srinivasan is a fellow of Association for Psychological Science. He was the Editor-in-chief of International Journal of Mind, Brain, and Cognition. He is currently an associate editor of Neuroscience of Consciousness, Royal Society Open Science, Frontiers in Cognitive Science, PsyCh journal, and Cognitive Processing and a member of the editorial board of Connection Science and Journal of Cultural Cognitive Science.